With Sveta’s, dream becomes reality for Russian immigrant. At 21, Sveta Yakubovich felt like she hadn’t done anything with her life. At 30, the possibilities looked endless. And today at 41, she can say she’s accomplished quite a bit without yet being satisfied. She has a thriving business – Sveta’s in Bradley Fair – a happy marriage and two children. “I feel like I can do anything,” she said. It’s a world apart from the future that seemed laid out before in her native Russia. Yakubovich grew up in Nizhny Novgorod, the former Gorky and the fifth largest city in Russia. After Mikhail Gorbachev ushered in the glasnost era, one of Yakubovich’s aunts made her way to Wichita, with help from the Mid-­‐Kansas Jewish Federation. Yakubovich wanted to go as well, but life got in the way for a while. She married, graduated from college and got pregnant. Yakubovich worked as a physical education teacher. But she couldn’t afford a nice pair of shoes, couldn’t travel, and saw no hope of advancement in Russia for herself or her son. And when a stranger’s comment on a bus drove home the reality of discrimination against Jews in her homeland, Yakubovich made the decision to emigrate. “Here I felt like you could have a job and a normal life,” she said. She arrived in 1993 with $500 and two suitcases to her name. She spoke no English. She had a 6-­‐month-­‐old son, Misha. She received public and private aid. Her teaching degree from Russia meant nothing here. But she was able to put to use the massage training she’d received while earning that degree. “In Russia, massage is a huge part of sports training,” she said. She worked as a masseuse in what was then the Wichita Racquet Club, now Genesis. She communicated with flash cards and phrases learned from customers, all of which she practiced in front of the mirror and with fellow Russian immigrants. She took English classes at Butler Community College and acupuncture classes at the Kansas College of Chinese Medicine. She absorbed everything she could from customers, who often became friends and mentors. She opened Sveta’s in 2000. “I didn’t know that every third business fails, which is good,” she said. She started with five employees. She gradually added services – facials, pedicures and manicures, waxing, chemical peels and makeup. Like every business dependent on discretionary spending, Sveta’s saw a significant downturn in the 2008 recession. But it survived, and in 2010 it expanded into the space next door, going from five rooms and 1,100 square feet to 10 rooms and 2,200 square feet. Today more than 20 people work for Yakubovich, most on a part-­‐time basis, which she said is the norm in the industry. $367 for the Imperial Package – deluxe massage, facial, pedicure and manicure. The average customer spends about $80. She said her clientele is about evenly split between men and women, with men getting the majority of massages and women the other services. Yakubovich sells a line of skin and body products with her name on them that are made by a Canadian company. A letter campaign has gotten her featured in trade publications such as DaySpa magazine. She puts a big emphasis on personalized service, urging her staff to remember whether a customer prefers bottled water before or after a massage, for instance. Little bags of candy are set out for customers around the spa, and Yakubovich confesses to being a stickler for cleanliness. The opportunity she sought as a teenager has become a reality. Her son, Misha, is a student at the University of California. Her daughter, Masha, is 10 – “my obsession,” she said. Her husband, Simon, works as a massage therapist at Wichita Country Club. She seems to appreciate freedom in the way that perhaps only somebody who’s lived without can. U.S. from Russia in 1993 with her husband and infant son, she had no job and spoke no English. The family had about $500 in their pockets. In 1999 Yakubovich enrolled in a Master’s program and, while still in school, opened Sveta’s Skin and Body Therapy in a 1,000-­‐square-­‐foot studio. “I knew I would rather work for myself, but I didn’t realize this was the right career path for me until I had my own company and my own employees,” she says. That people-­‐first focus has paid off financially. In 2010, Yakubovich expanded her facility to encompass 2,200 square feet. She is a celebrated entrepreneur in her community, and was recently named one of the top women in business by the Wichita Business Journal. Nineteen years ago, Sveta Yakubovich came to Wichita with her husband and 6-month-old son. Sveta was 21 and barely knew English. She planned to become a physical education teacher. “I just wanted a better life for my kids, a better future,” Yakubovich says. She began giving massages, a staple for athletes in her native Russia, for what was supposed to be a side job. To interact with her clients, she would have phrases written out in English on cards, which she would practice over and over. Apparently, It was endearing to her clients — as was Yakubovich’s inquisitive and high-­energy personality. She soon was making more money at massage therapy than she could as a teacher. 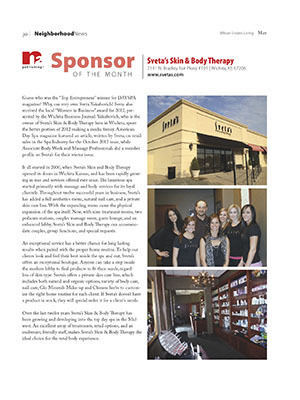 In 2000, she opened Sveta’s Skin & Body Therapy at Bradley Fair. Her company now has 23 employees. No doubt, Yakubovich benefited from having a high-­‐profile clientele base. Emprise Bank’s Mike Michaelis and real estate developer George Laham are part of it. Yakubovich developed a business philosophy that she believes sets her apart — it’s about much more than just a massage. Fellow WIB honoree Katie Lynn, executive director of Arts Partners and a long time client, says Yakubovich always is learning. JoVetta Wescott, executive director of the Kansas Parish Nurse Ministry Inc., remembers the first time Yakubovich told her about her plans to start her own business. “She has big visions of where she wants to go, and it’s not to keep up with anybody else. It’s what she wants to do business-­‐wise,” Wescott says. Sarah Bagby, Watermark Books and Cafe. Tami Bradley, Bothner and Bradley. Linda Brantner, Delta Dental of Kansas. Pat Jones, Dress for Success. Dixie Larson, Kennedy and Coe LLC. Samantha Marnick, Spirit AeroSystems Inc.
Jill Miller, Jill D. Miller Creative Solutions. Linda Parks, Hite, Fanning and Honeyman LLP. Rachael Pirner, Triplett Woolf and Garretson LLC. Susette Schwartz, Hunter Health Clinic. Jackie Vietti, Butler Community College. 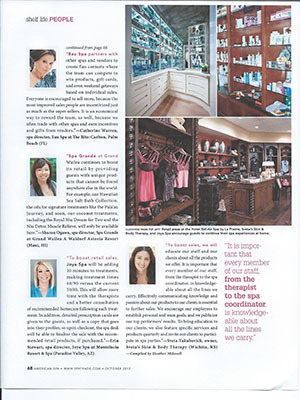 Judy Worrell, Berry Cos. Inc.
Sveta Yakobovich, Sveta’s Skin and Body Therapy. Lori Davis, Grant Thornton LLP. WICHITA — A decade after opening at Bradley Fair, Sveta Yakubovich is doubling the size of her Sveta’s Skin & Body Therapy. “We’re still keeping . . . who we are,” she says. “It’s just kind of time to grow.” Part of the reason with the timing is because Zumo Juice will be leaving its space. Sveta’s has 1,000 square feet and will now have 2,200 square feet with the Zumo space. Construction starts in October, and the business will remain open during the expansion. The additional space will allow for double bookings for, say, a mother and daughter who might like to schedule appointments at the same time. She’ll also have a larger room for training employees and offering clients classes for things such as couples massage. The reception area also will be larger, and there will be a private relaxation area for clients to use between services. Spangenberg Phillips Tice is the project architect. Key Construction is the contractor. Sveta’s expansion is one of several new things happening at Bradley Fair. LBD, etc., a women’s clothing boutique, and Carla’s Love It, a clothing and gift store, recently opened. Newport Grill, a seafood concept by the owners of Yia Yia’s EuroBistro, opens in November. (WICHIТA, KS) – Laham Development has announced that Sveta’s Skin & Body Therapy will expand its present location in Bradley Fair. The spa is celebrating its 10th Anniversary in Bradley Fair and will hold а celebration in the fall of 2010, when renovation is completed. Sveta’s will double its size with the expansion, acquiring the space previously occupied bу Zumo Juice. The announcement was made bу Cathy Erickson, vice president of Laham Development. Sveta’s signature emphasis оп client privacy will be enhanced with the expansion. The spa combines therapeutic services with а high level of convenience. This approach is designed to work well with clients’ busy schedules. The entry waiting area size will be increased, with а small private waiting room added for clients to relax between services. The expansion will include space to accommodate groups for private parties and to teach massage classes. This will also provide space for the future addition of other services. Bradley Fair recently announced three new additions to the lifestyle center. The Lbd, Etc., а boutique specializing in women’s clothing opened оп August 14. Carla’s Love It, а locally-owned clothing, jewelry, and gift store will open оп August 31. Newport Grill, а new restaurant concept1 will open in November. Newport Grill will feature fresh seafood, steaks, chops and seasonal specialties. The restaurant will be located оп the south side of Bradley Fair Plaza, with а view overlooking Bradley Fair Lake. А project of Laham Development, Bradley Fair opened in November 1990. The lifestyle center features тоге than 50 stores and restaurants, including specialty boutiques and prominent national retailers. The focal point of the center is Bradley Fair Plaza, а scenic open-air venue that features а lake, an island waterfall and а year-round fountain. Each year, а number of community events are hosted оп Bradley Fair Plaza including summer jazz concerts, opera performances, and holiday carriage rides. А new event, Autumn & Art at Bradley Fair, will be held in September. Autumn & Art is а fine arts fair with exhibits by over 60 local, regional and national artists1 culinary arts and entertainment. The project architect is Spangenberg Phillips Tice. The project contractor is Key Construction, Wichita. For more information, visit bradleyfair.com. and lahamdevelopment.com. In March, Sveta’s Skin and Body Therapy unveiled its new signature collection of skin and body care. The debut of Sveta’s product line is a very exciting event for Sveta’s spa, which predicts a very positive response to its collection of natural products. One application of the highly effective Anti-­‐Aging Serum with DMAE confirms the advantages of naturally active botanicals (NAB’s); a strong focus of Sveta’s commitment to a more natural approach in skin and body care. The essential oil blends that have been used in the products produce a relaxing and calmative effect on the user. For example, neroli, extract of orange flower, and lavender essential oil are both thought to relieve stress and lift the mood. They can be found in a number of the spa’s special formulas. Sveta’s Skin and Body Therapy formulas have been incorporated into many of the spa’s treatment offerings as well. Facial treatments featuring a Moor Mud masque and a new body treatment utilizing a remarkable seaweed extract are just two of the spa’s special offerings that help clients de-­‐stress and look their best. Such customized treatments are key to the spa’s success, claims Sveta. Because an individual approach is so important, she recommends that new clients schedule a complimentary consultation to learn more about their skin or body care needs. For more information on Sveta’s Skin and Body Therapy product collection, or to schedule a complimentary skin or body analysis, please call 316-­‐630-­‐0400.